I couldn't afford Berni Wrightson's stunning Frankenstein art portfolio when it was released in 1978. It was limited to 1000 copies. Mr. Door Tree has scanned the entire portfolio in high resolution on his blog. Original copies of the portfolio are on Amazon for $200. Wrightson (who now spells his first name Bernie), was influenced by EC's "Ghastly" Graham Engels and Frank Frazette, and classic illustrators like Pyle and Wyth. 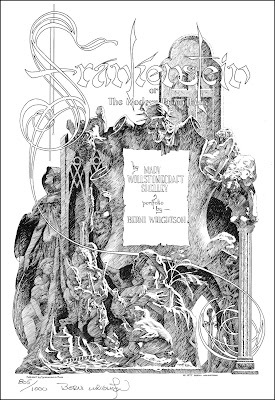 In 1983, he drew 50 illustrations for a special edition of Mary Shelly's Frankenstein. Bonus! Portfolio of early Wrightson art. Portfolio of Wrightson's Swamp Thing work, which is where I discovered him.